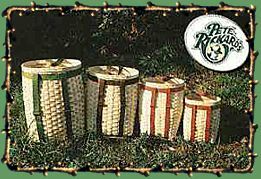 For centuries, the pack basket has used be used by many nations and people. Most notable among these nations, was the French,who designed and used the pack basket in its present form. Then it was used primarily for the transportation of food and meat. Today man has been given the opportunity to carry in a handmade ash and rattan pack basket the many things he needs for ice fishing, hunting, canoe trips, hiking and more. Note additional shipping charges may apply on multiple baskets. Quality hand crafted baskets for trappers,hunters,ice fisherman and back packers. These baskets are made of Ash. Heavy Duty and durable. Choose from 12", 15", 18" or 21" size baskets. Great pack, holds alot of stuff, I use mine for mushroom hunting, shed collecting and rock collecting. My trapping buddies lovem cause you can make dividers and scents stay upright and they don't fall over. Pack looks good next to the fireplace when not being used.